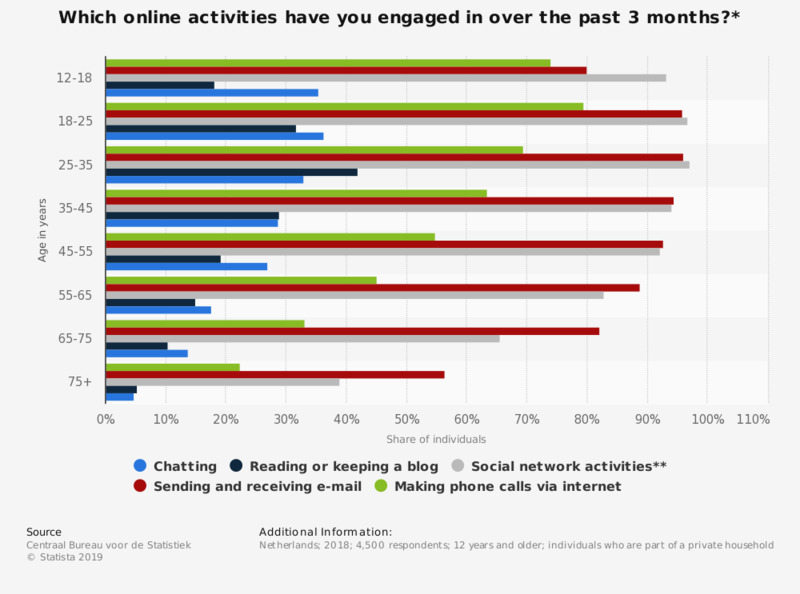 This statistic shows the responses to the survey question: "Which online communication activities have you engaged in over the past 3 months?" The figure illustrates the share of individuals who used the internet for online communication activities in the Netherlands in 2018, by age. As of 2018, 22.3 percent of 65 to 75 year old Dutch individuals said they used the internet to make a phone call. * Original survey question: "Did you use the internet in the past 3 months for one of the following activities: To send or receive e-mails; To make phone calls via the internet; To chat; To read or keep up with blogs; To Exchange text messages; To participate in a social network like Facebook or Twitter; To participate in a professional network like LinkedIn." ** The latter three survey answers are grouped together as 'social network activities': exchange text messages; participate in a social network like Facebook or Twitter; participate in a professional network like LinkedIn.